The installion, known as the WEX machine, looks like this. It photographs itself regulalry through each day. Each new image is then uploaded online and becomes the website's homepage. The various elements on the trolley provide some of the functionality of a traditional site: click on the screen on the left and information about the space and its activities can be read. 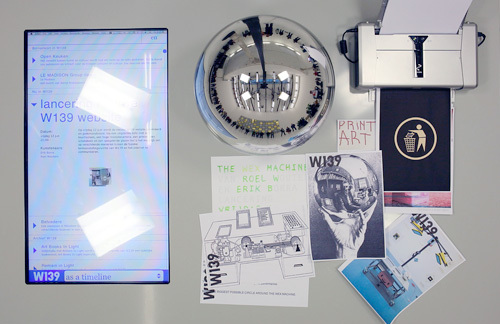 Users can interact with the printer on the right: choose a file from your desktop and the printer will output it, for real, on the trolley in the gallery. 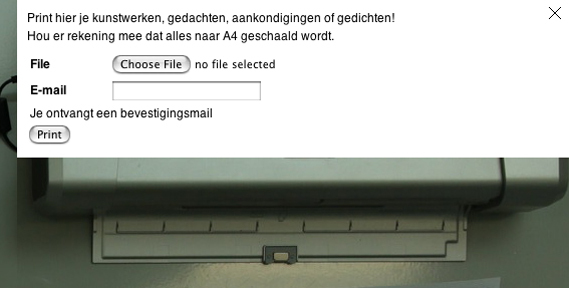 When the site next updates, your image will appear in the pile of pages next to the printer. The large mirrored ball reflects whatever is on display in the part of the gallery that the trolley has been temporarily parked in. 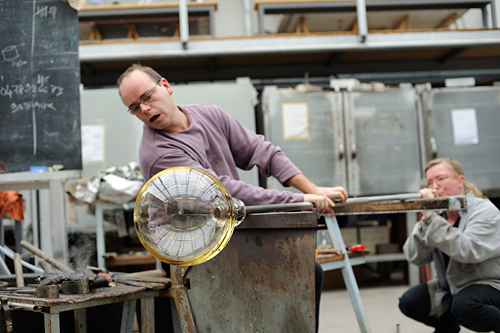 The WEX machine was created by Roel Wouters (one of our Creative Futures from last year) and Erik Borra. 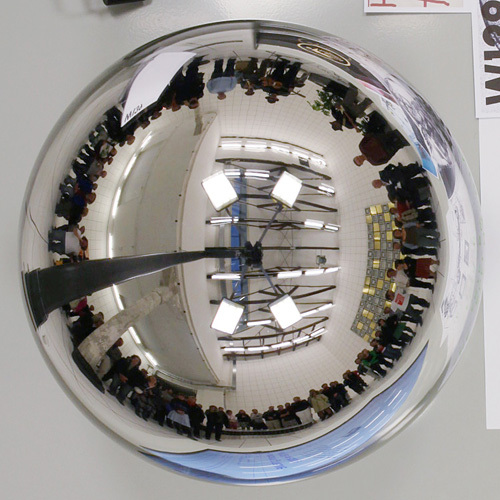 "The WEX Machine has two different faces: a physical installation within W139 itself, and virtually on the web," they explain. "Visitors, whether online or offline, can contribute to both installation and site. 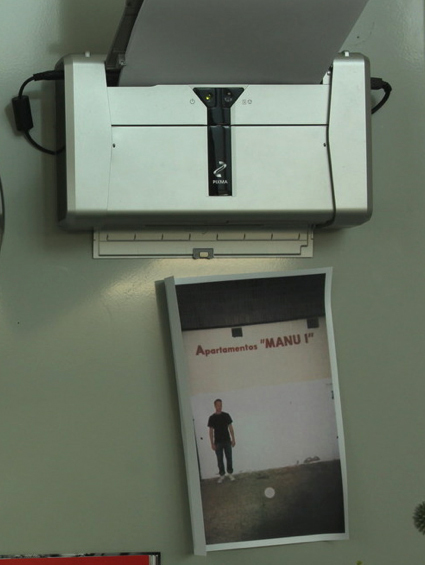 Visitors to the site can upload a file and print it on the printer at the installation. If the website is not used for a while via the touch screen it will start playing all by itself, generated by pathways (clicks) chosen by the site's other online and offline users. By later playing these clicks as a movie, the visitors' online behaviour is used as user generated and curated content within the installation and website." The idea is rooted in American scientist Vannevar Bush's concept of the memex, the theoretical proto-hypertext computer system he proposed in 1945 which some claim as a conceptual forerunner to the web. Bush saw the memex "as an electromechanical device that an individual could use to read a large self-contained research library, and add or follow associative trails of links and notes created by that individual, or recorded by other researchers". 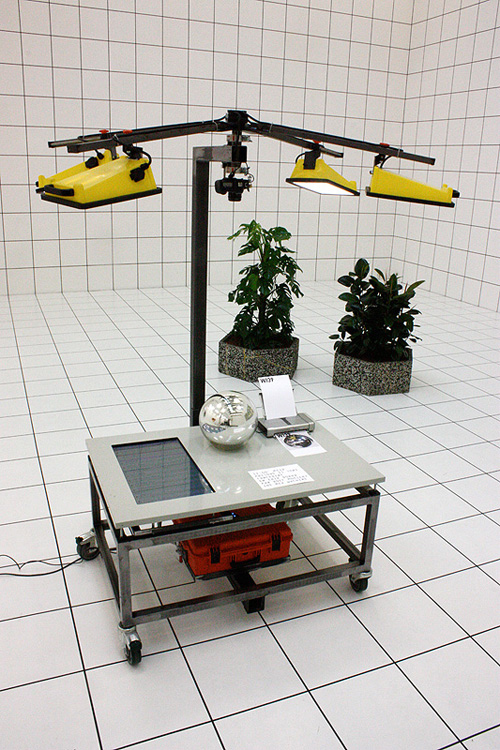 The WEX Machine is a project by Roel Wouters & Erik Borra, a Vincent Lindeboom production, developed together with the staff members of W139 and Rene Bakker. Du site internet DIY... J'aime assez l'idée que le site soit un objet quelquepart dans un espace (ici une gallerie). Le problème reste qu'il ne s'agit essentiellement que d'une image mise à jour. Certains éléments peuvent être identifiés par du tracking visuel et une interaction automatiquement attribuée, mais il est difficile d'y développer une interaction subtile. Donc cela ne peut être autre chose qu'une homepage. 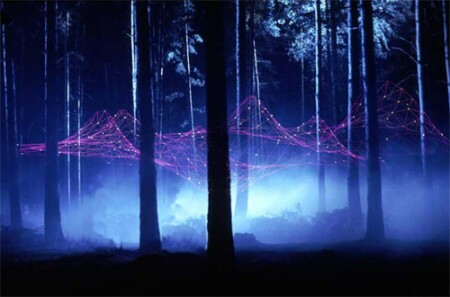 Designed by Mark Francis Tynan & William Hailiang Chen, ResoNet visualises the resonant frequencies inherent in the natural environment, via the interaction of the public and surrounding elements detected by a LED net. By using Low-Fi techniques ResoNet creates a cascade of light triggered by the vibrations detected across the structure. 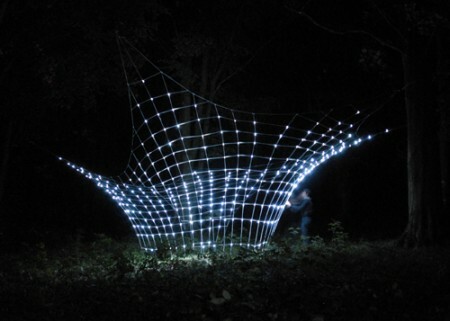 ResoNet’s tensile web structure is stretched across a space, like a spider web. A series of vibration sensors & LED circuit components are fixed at key intersections on the tensile network, to detect minute vibrations as a result of human and natural activity. J'aime bien l'idée que le "sensor network" réagisse à des vibrations (d'une structure, d'un lieux, etc. ), révélant ainsi comme des pulsations cachées, des courants d'air, ... Pour une fois que la structure ne réagit pas aux "utilisateurs". Cela à tendance alors à ouvrir vers d'autres paysages ou environnements. 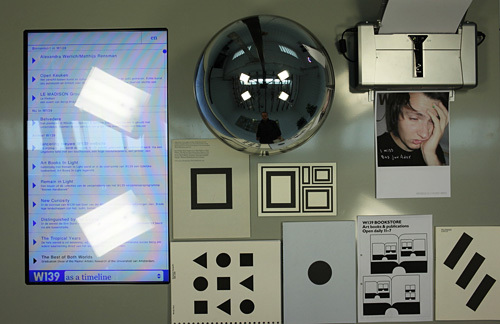 "Billed as an “intelligent, multi-user Touchwall” the kit, made by Schematic, uses their previous multitouch panels to create a surface which can be used by multiple people. It is being used for the first time at an advertising festival in Cannes, where it can recognize attendees by their RFID badges and offers them a personalized workspace wherever they happen to be standing. It also displays relevant info, such as 3D maps of where they need to go and features a built in social network element for users to leave each other messages. But the special thing about the Touchwall is its multi-user capabilities where people can work side by side and even share information. Cannes attendees can use it to get directions around town, browse festival program information, trade contact info, and schedule meetings" Good (though with unwitting irony). 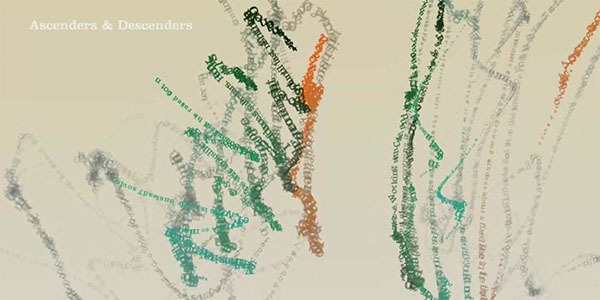 Golan Levin has announced that many of the talks at Art & Code are available online to watch here. Below is a video of Ben Fry and Casey Reas talking about Processing and above Golan himself talking. Make sure to check out openFrameworks too. Art & Code was a conference and continues to be an online community focused on programming environments for artists, young people, and everyone else. The conference took place on the weekend of March 7-9, 2009 on the campus of Carnegie Mellon University in Pittsburgh, PA. It featured hands-on workshops and a symposium showcase for 11 different creative toolkits — programming languages made by artists, for artists. Check out the website for plenty more information on the Art & Code community. Je dirais "Architecture, art & code" pour fabric | ch! Communauté (et cycle de conférences) à suivre peut-être pour soumettre des approches plus orientées sur le code (Rhizoreality, etc. )?